Multi Ch. Suncatcher's Hop into my Heart "McKai"
We picked McKai up on the 22th of April. His weight was 3.6 kg. McKai is confident and he is a very enthusiastic dog. He is persistent in all the things he does and he does not give up very easily. He has an open character and is a very relaxed male. He loves being around people and other animals. He is always happy! He likes to learn and is very easy to work with, although he can use his own mind also during work. Kay-lo and McKai are very good friends and they play a lot together. They have never been in a fight with each other. McKai learns a lot from Kay-lo. On 23 July 2011 McKai got his certificate Basic Obedience. He had a very nice review with only Excellent! We added a video of this examination at videos. On 19 February 2012 he got his certificate for Social Obedience. 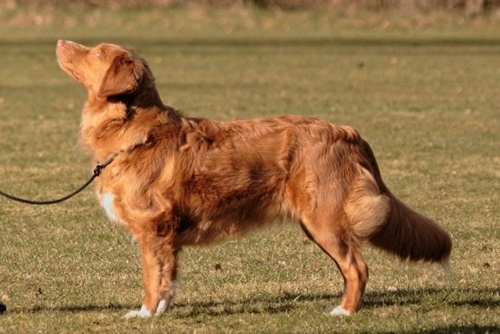 This is a course for social behavior around other dogs, people and strange objects and sounds. He passed with only Good! We also have a video of this examination in his video album. 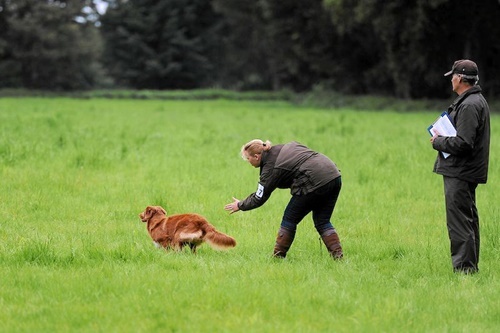 We started the course retrieving in november 2011, and our hunting course at the KNJV since April 2012. We enjoy seeing him at work! He loves to retrieve dummies or cold game. He is a good swimmer and he has a lot of "will to please". In 2012 he participated at a Tolling weekend in Belgium. He worked great and he got an Excellent in his class. He also became Tolling Trial Club Winner Initiate 2012 (BTC). In 2013 he got a 1 Prize during an official Tolling Test in Denmark. Since winter 2014 he also participate at a practical hunt. He has experience with hares, ducks, crows and pigions. He loves the work in the field. 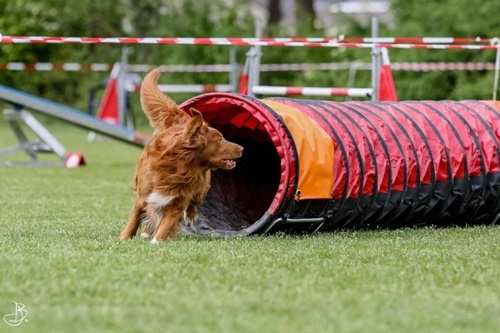 We started a course Agility at the end of 2013. McKai likes Agility also very much. In 2014 he promoted to class A. He has been to several shows and he likes being at a show. Until now he achieves Excellent results and he already has some very nice championship titles. In May 2014 he became an International Beauty Champion (C.I.B.). This is for breeds subject to a working trial. He is the second Toller in the Netherlands with this title so we are very proud of this result!! Because of his character, good work and good health results we decided to make him available for breeding. All the necessary tests are completed and you can find the results below health results. 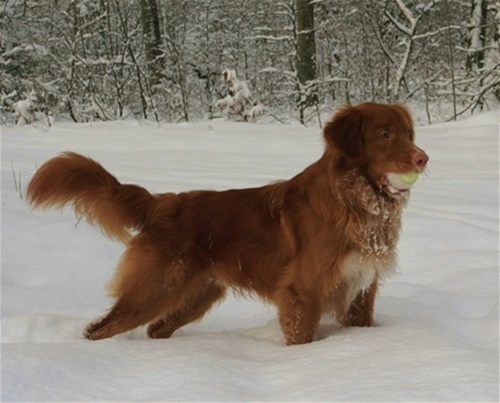 McKai has been approved as a stud dog by both Toller clubs in the Netherlands. McKai has sired five litters (33 puppies). Please click on offspring for more information about his progency. Rhineferry's Little River Duck NiC "River" Ch. Suncatcher's Naughty by Nature "Pebbles"